Derrick Nxumalo was born in Dumisa, Scottburgh (Umzinto). A former gardener, miner and waiter, he has recently added politician to his list of activities outside of art, being elected as a councillor for Vulamehlo (Dududu) district in KwaZulu-Natal. As an artist Nxumalo is self-trained and to reach the desired end-product he has adopted an adventurous and determined approach to his technique and subject matter. He has developed a unique style using his imagination and experience and has come up with work of intricate and intriguing quality. His work is based on acute observation, often omitting the physical human presence. It is nevertheless a testimony to an extensive human existence and interaction with the environment. The omission of the human presence often presents a surreal effect, with fine architectural details deployed with an absorbing understanding of perspective and colour in its purest form. In Luthuli high school (plate 249), Nxumalo depicts movement without motion, mapping the inner-city grids in a decoratively pleasant, kaleidoscopic kitsch style. Buildings, parking bays, billboards, roads and dustbins are devoid of any living creature, but live to tell of a reality within a mind that dreams. Bright colours and obsessive detail cleverly disguise this angst-ridden urban excess and sometimes also the real issue at hand. Questions of land ownership are ever-present in Nxumalo’s work; his omission of humans can be seen as an open-ended debate and the reluctance to give or take away power. The subtleties of the work featured here rest in the title, Luthuli high school, which memorialises Chief Albert Luthuli in a manner useful to the community. Chief Luthuli was elected president of the African National Congress (ANC) in 1952 and served in this capacity until his death in 1967. In 1960 he became the first African person to be awarded the Nobel Prize for Peace. The history of public memory in South Africa has until recently been focused on colonial history; the apartheid government did not erect statues to recognise black innovators who influenced change. But schools named after prominent black leaders have since risen to the fore. Luthuli High School is one of them; it is among the first fruits of the struggle, a constant presence and a vision for the future. It highlights education as one of the significant tools to liberate previously suppressed minds, and reminds us of the contribution to our freedom made by this prominent black South African. 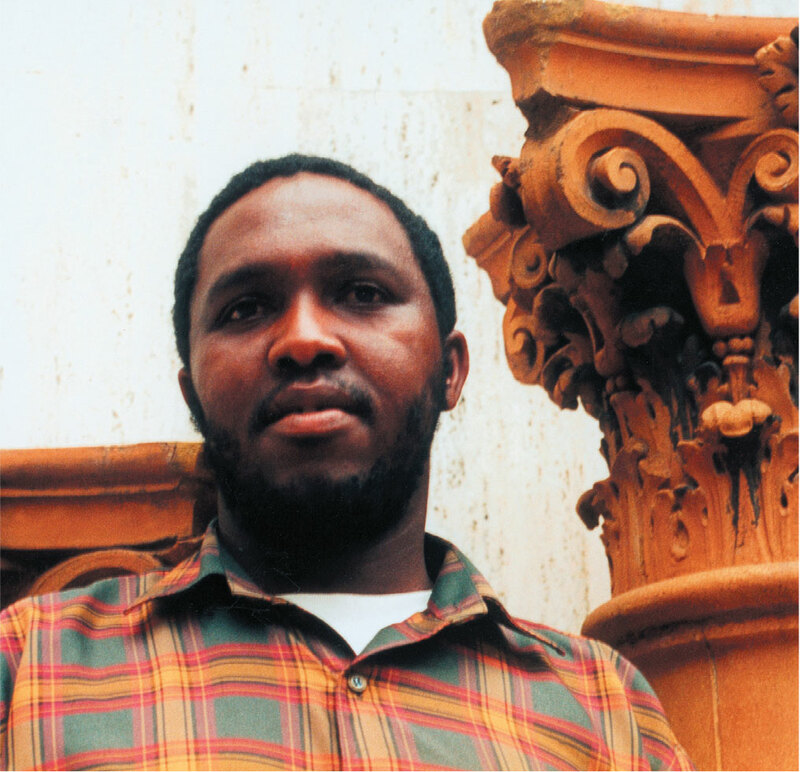 Born Scottburgh (Umzinto), KwaZulu-Natal, 1962. Training Self-taught as an artist. Exhibitions 1988: Cape Town Trienniale, Iziko SA National Gallery. 1990: Vulamehlo – Open Eyes, Durban Art Gallery. 2000: Abelumbi, Untold Tales of Magic, Durban Art Gallery. Collections Killie Campbell Collections, University of KwaZulu-Natal, Durban; Tatham Art Gallery, Pietermaritzburg; University of Witwatersrand, Johannesburg; Durban Art Gallery. Photograph of Derrick Nxumalo. Courtesy of Anthea Martin, African Art Centre Archives, Durban.